Get smart and join us Sept. 24 for an interactive breakfast event and explore Panasonic's CityNOW Smart City. This interactive tour will showcase smart community spaces and technology. Touch the fixtures, turn the door knobs, open the closets, get up-close and personal in this tech driven space. Once you've experienced this, the smart ride continues when you hop on board the EasyMile EZ10 electric autonomous shuttle. 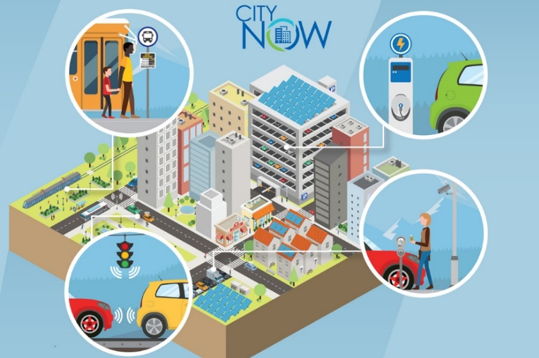 Get smart and join us Sept. 24 for an interactive breakfast event and explore Panasonic's CityNOW Smart City. This interactive tour will showcase smart community spaces and technology. Touch the fixtures, turn the door knobs, open the closets, get up-close and personal in this tech driven space. Once you've experienced this, the smart ride continues when you hop on board the EasyMile EZ10 electric autonomous shuttle. The world is changing daily and tech is ever expanding. Join us to learn all that is happening in Denver. Let's go! Limited number of free student tickets available. Sales end on Sept. 19. You can take transit! Panasonic Smart City is only a 5-minute walk from the 61st & Peña Blvd Station. Free onsite parking is also available at both the front and rear of the building. Please do not park at the RTD park and ride station.If you have questions, please contact Annie Kitch for more information.